The Buchla Easel V is the first recreation of Don Buchla's iconic instrument that helped define experimental West Coast modular synthesis in the early '70s. Our enhancements translate to vastly expanded possibilities for sound design and avant-garde music. You've always wanted to paint with sound. 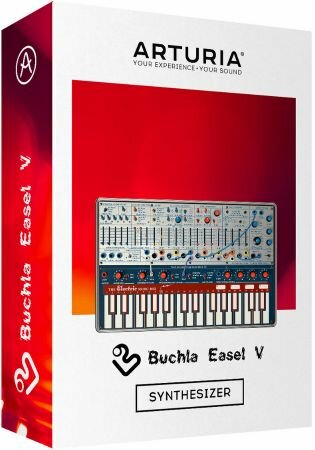 Now you can with the Buchla Easel V.
One look at the Buchla Easel V and you know this is a different beast. In fact, it makes you think differently about sound right from the start-and the soundscapes you can design with it are as unique as the front panel array. To put that experience at your fingertips, we meticulously recreated the rare 1973 Buchla Music Easel right down to the component level. As you've come to expect from our other V-series instruments, we've gone the extra mile by designing in an enhanced feature set including polyphony, innovative new modulation/control sources, step sequencer, effects, and more. The Buchla Easel V faithfully reproduces Buchla's Music Easel that helped define West Coast synthesis' focus on experimentation and breaking musical norms. We've applied our award-winning TAEв„ў modeling technology from the front panel to the resistors to capture it all with incredible realism. Complex oscillator design, AM and FM synthesis, uniquely percussive gate/filter combos, and numerous ways to modulate and clock just about every parameter, all drop you right in the middle of a sonic sandbox. Design and perform soundscapes that burble, shimmer, pulse and evolve without ever touching a keyboard or pad-unless you want to add even more control. Nearly 300 presets by expert sound designers get you started with timbres ranging from hauntingly beautiful sonorities to clangorous pokes in the ear. Whether you're looking to experiment with simple sounds or build complex evolving passages, the Buchla Easel V is a constant source of inspiration for sonic adventurers. In addition to faithfully reproducing a classic, we've infused the Buchla Easel V with even more of that vintage goodness to love. With our extensions to Buchla's original design, you now have an even more intuitive programming experience paired with additional sonic options. * Note that while our extreme modeling at the component level on the Buchla Easel V delivers insanely great analog sound, each voice of polyphony requires significant processing power to pull it off-approximately 20 percent of an i7 CPU per voice.